The Master and Apprentice System has been newly designed with the purpose of enhancing the interaction between Veterans and Newbies. With the help of this system, Newbies can become used to the game more quickly, whilst the veterans can gain rewards through teaching. First, we'd like to tell you how to get a master. Please pay attention. 1. Who can become an apprentice? 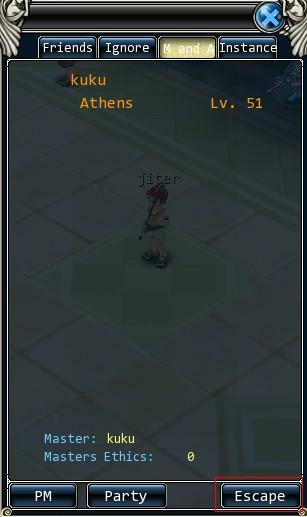 a.Characters should be below level 49 and their level must be at least 30 lower than their chosen master's. b.Characters do not already have a master. c.Characters haven't ended a master and apprentice relationship within the last 24 hours. After meeting the previous requirements, you may follow the steps to getting a master. a.Team up with the master that you want to learn from. 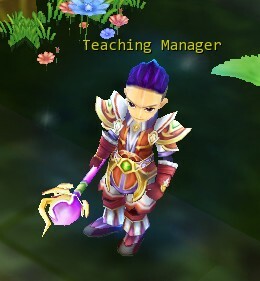 b.Together you should go to find the "Teaching Manager" in the main city and then the master should talk to the NPC. c.A dialogue box will appear, click "Okay". d.The system will inform you if you have successfully gained a master! If you want to get a better master, you must end the current master and apprentice relationship first. a.Open the Friends interface and click the "Escape" button at the right bottom of "M and A" column. b.Confirm again and the Master and Apprentice relationship will be ended. Note: You may only have a new master 24 hours after you've escaped from the last one. Likewise, the master can't accept an apprentice within 24 hours. The progress of each apprentice concentrates the masters' painstaking efforts. Once the apprentice reaches level 50, their apprenticeship is finished. What rewards will they receive? a. Apprentices will obtain special titles during the apprenticeship. b. When apprentices finish their apprenticeship, they will gain big rewards including: 200,000 Exp, 50 Talent Points, 20,000 Silver and 2000 B-Gold. Since there are so many veterans in this ancient Greek land, why not pass on your experience to the younger generation? Next, we will tell you how to accept an apprentice. 1. Who can become a master? 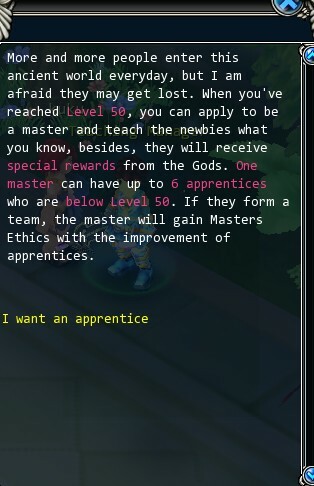 a.Masters should be level 50+ and their level should be at least 30 higher than that of their chosen apprentice. b.Masters may not have more than 6 apprentices at a time. c.Masters haven't ended a master and apprentice relationship within the last 24 hours. If you meet the previous requirements, you may have an apprentice by following these steps. a.Team up with the target you wish to help train. 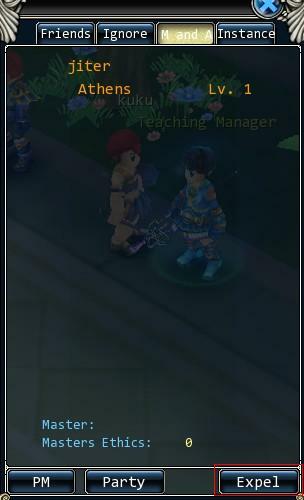 b.Find the "Revered Teacher" in the main city and talk to the NPC. After that, click "I want to have an apprentice". c.After the target confirms you will have successfully gained an apprentice. If you are not satisfied with an apprentice, you can also end the current master and apprentice relationship. a.Open the Friends interface and click the "Expel" button at the right bottom of "M and A" column. b. Confirm again and the Master and Apprentice relationship will be ended. Note: If the master expels an apprentice, the Masters Ethics will be deducted and he cannot accept a new apprentice for the next 24 hours. In the meantime, that apprentice cannot learn from a new master for 24 hours. Masters will receive rewards once their apprentices level up. It's quite difficult for masters to help their apprentices to reach level 50. Thus we have prepared appropriately fabulous rewards for the masters. a. When the master teams up with the apprentice, as long as they level up, their master will be rewarded with Masters Ethics which can be exchanged for Gold or other rewards. b. When apprentices finish their apprenticeship, their masters will receive 100,000 Exp, 20 Talent Points, 10,000 Silver and 200 Reputation. c. If masters meet the requirements for having enough apprentices, a special title will be awarded to them. This is a brief introduction to the Master and Apprentice System, if you want to experience it, get into the game and enjoy mythical adventures in GodsWar Online.